being out in the fresh air. 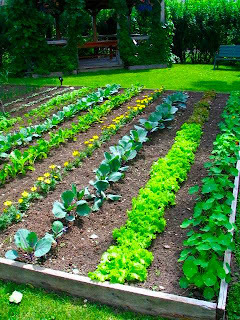 Follow these simple steps to starting your very own garden. Garden Bed – First things first, designate a garden area. It can be close to the house or on the edge of your property, just keep the following in mind. You’ll be going out to your garden often, if not daily, so make sure it is easily accessible. On the other hand, if you entertain regularly, have small children, or pets, make sure your garden is not in the middle of the backyard. Instead, place it off to the side, where it won’t be easily disturbed. It’s best to place fencing around your garden even before you begin planting. This will keep vermin and small critters from trampling your plants. While choosing the perfect spot, keep in mind that most vegetables need a full eight hours of sunlight; pay attention to what areas get the most exposure. Soil – Before you begin planting seedlings, it’s important to test your soil. In order for plants to grow big and tall certain nutrients must be present. Get your soil tested by a local gardening center to see if it lacks any of these nutrients; if it does, you can easily add them by using an appropriate fertilizer. Watering System – Aside from sun and soil, plants also need a daily dose of fresh water. Before you get your hands dirty, make sure you have an easy and effective way of watering your garden. If your garden is small and close to the house, a simple gardening can or garden hose could do the trick. If the garden is not close to the house, perhaps you should attach a sprinkler head to the hose and run it out to the garden. If you don't think you'll have much time to spend in your new garden, then its’ probably best to invest in an automatic sprinkler system. Good luck as your begin planting your very first garden!